One of my favorite image inspiration sources is architecture. Structures that we see everyday can have such a different appearance through the lens of a camera. With the right perspective and vision, ordinary objects can take on new life, and a custom wall mural is the perfect way to display that vision. 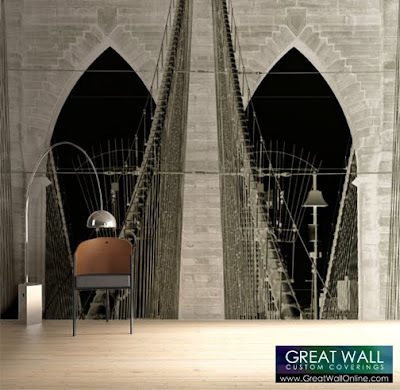 The custom wall mural in our inspiration room features the Brooklyn Bridge. An iconic structure, the Brooklyn Bridge is certainly one of the most recognizable bridges in the world. But the change in perspective gives the image of the bridge an almost cathedral-like feel, with it's arches soaring. Many of us have photographs similar to this, contact us to learn how to turn your digital photographs into stunning custom wallpaper.